This trip starts and ends in Bilbao. 7½ driving days and 7 overnight stays. 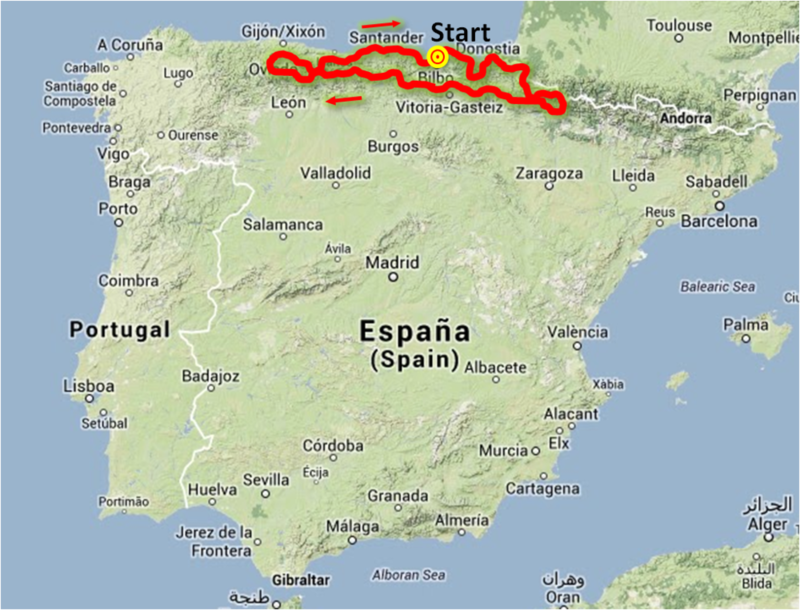 The first part of the route takes us along the Northern coast eastwards. This is an exceptionally beautiful stretch with curvy roads, large pine trees and tempting beaches. We pass a number of highly picturesque fishing villages and we will reside in one of these the first night. The next day we continue along the coast for a little while and drive inland into the typical green hills of the Basque Country. In the afternoon we reach the scenic town of San Sebastian which has one the most beautiful beaches in Europe. It is formed like a shell, hence the name, La Concha. In the evening we visit the old part of town for tapas – there is an abundance of possibilities. The next day we pass through the Basque countryside which is exceedingly hilly moving towards the Pyrenees. Our destination for the day is a small mountain village in the Pyrenees where we will stay for two nights. The next day, we will be exploring the high and vast mountains which have numerous curves and excellent views. The following day we will ride onwards towards the west passing Pamplona, famous for the running with the bulls in the annual San Fermin-festival. We continue passing valleys, mountain passes and charming small villages. We will stay over the night in one of these pueblos, villages, which has an interesting history and a very old town center. Then we move on along the hilly, green landscapes soon to find ourselves in Picos de Europa, which are in sharp contrast to the Pyrenees. The mountain range is not as high or vast but it is much more steep and dramatic. We stay in one of the small mountain villages for two nights and the next day we make a roundtrip in the mountains passing Covadonga and the nearby lakes which makes beautiful scenery. The last day takes us back to Bilbao through the partly through the beautiful countryside and partly alongside the scenic coast. The trip takes it’s start in Bilbao, which is the capital of the Spanish Basque province of Vizcaya. It was founded in 1300 and has overall enjoyed an uneventful history until the 19’th and 20’th centuries where it was besieged several times during civil wars. Spain was invaded by the Moors (Berbers from Marocco) in the early 7’th century and this sparked a new rule which saw its peak around year 1000 where an independent caliph was reigning. The Moors occupied most of the peninsula except for the region of Asturias located in Northern Spain between the Biscayan coast and the Picos de Europa mountain-range. When the Moors moved towards the north following the Christians into the Picos de Europa mountains, the Moors were ambushed and defeated by the Asturians at Covadonga and since then, they have claimed the area to be the cradle of Spain. The ambushers were led by the guerilla Pelayo, who only had a small army of 300 men. When the Moors were defeated, Pelayo was proclaimed King. The Moors had other priorities, they moved towards the east and Southern France, and this gave the Christians the possibility to consolidate their strength and the reconquista, winning back the lost land, began. Welcome to Frontera. Frontera offers guided motorcycle tours in Spain - Great nature, wonderful views and mountain curves all topped up with some exciting Spanish history and culture. "Even with 35 years of motorcycling experience in the US, Australia, New Zealand, Africa, Brazil and Europe, I can only say after participating in Frontera's Málaga to Madrid Tour that it was superb. It can only be recommended! ", Henrik Kristensen, Asnaes, Denmark, Frontera tour participant. Contact and how to join one of Frontera's tours: Go to 'Contact page'. The motorcycle models available to you include the BMW R1200GS LC (Liquid Cooling). See models available at: 'Motorcycle Models'. Frontera offers unforgettable motorcycling in best possible conditions. "This is World Class", Peter Schwensen, Fredensborg, Denmark, Frontera tour participant.